The show opens with Corporate Kane listening to Stephanie and HHH on speaker as they tell him he will have to be in charge. They are running late. HHH and Steph ask him to be professional, even HHH going as far to plead with him to stay away from Seth Rollins. Kane then tells a stage manager to alert Rollins that he will have a lumberjack match tonight…against himself. Dean Ambrose heads out to the ring. He first addresses the crowd on how the authority are running late then talks about the inmates running the asylum. Ambrose promises not to bore us and that he is more about actions than words as he is looking for a fight. Randy Orton’s music hits and he comes out to the ring. The crowd is hot for Orton, who starts by kissing up to the home crowd. They tease a little bit of tension after Orton tells him they will be facing Luke Harper & Braun Strowman at Hell in a Cell then says if they want to end the war against the Wyatts, he should follow his lead because he has been here longer. Ambrose doesnt trust Orton, who does not even trust himself, and they stare each other down until the New Day come out. They all brag about destroying Cena, Ziggler, and the Dudley Boyz on RAW last week and how neither man did the same with their former factions. The New Day laugh about all the factions and stables Orton was a part of, with Kofi joking that he is a “groupie,” before telling them to “sit on the bench” like Derrick Rose. (For those unaware, Rose is a very talented but often injured point guard for the Chicago Bulls). Kane is then shown on the big screen as he books the New Day vs. Orton & Ambrose…right now. Not a strong segment to start the show. Just a whole lot of talking to set up a match between guys who are not feuding. Ambrose and Kofi start of the match. They mess up a spot as Ambrose nearly stumbled ducking a leapfrog with Kofi, does it again and sells it like he got elbowed before rolling outside as we head to break. We return with Big E getting worked over for a while as Orton & Ambrose they are still teasing tension. 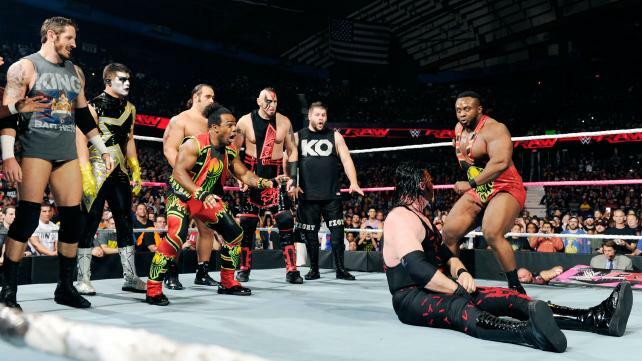 They continue to dominate while arguing then toss Kofi, who just tagged in, out to the floor. We return with Kofi having Orton in a chinlock as we saw clips of Xavier interfering during the break to give New Day control of the match. Orton is getting worked over in the corner while Woods plays the trombone and jaws with the fans. Woods is taunting Orton by continuously calling him “Randy.” Orton sidesteps Big E’s apron spears both men are down. Orton makes the tag and Ambrose runs wild on Big E. He takes Kofi out with a tope and pulls the ropes down on Big E before taking both guys out with another tope. Back inside, Ambrose gets two off of a top rope clothesline. Woods distracts Ambrose enough for Big E to hit him with a belly-to-belly suplex but Ambrose makes the tag as Orton runs wild on Kofi. He hits his signature spots, with the crowds approval, but while setting up for the RKO, Kofi blocks the move and shoves Orton into Ambrose, who was preventing Big E from interfering, then Kofi rolls up Orton for the win (17:52) **. Thoughts: A really dull match until the last few minutes. After standing tall last week to end the show, the New Day came off as lucky to win this match. There is also more doubt between Orton & Ambrose and the ability to get along for the match against the Wyatt Family. Before the match, the announcers put over the Sasha vs. Bayley match from NXT: Takeover Respect, even quoting various journalists praising it while showing us a video package of the match itself. Match starts with the girls fighting over a lockup while “We want Sasha” chants break out. Naomi takes control with a headscissors out of the corner but gets caught with a spinebuster, Nikki taunts the crowd after hitting a snap suplex then targets the back and neck of Naomi while JBL questions how long the rest of Team BAD will be able to tolerate all of the Sasha chants. Naomi fights back with a few kicks then dumps Nikki to the floor. Naomi flies out with a plancha of sorts, nearly killing herself in the process, then Brie takes a mic and stands on the announcers desk taunting her in the least convincing way humanly possible with “We want Sasha” chants. Sasha takes her off as the crowd cheers but back in the ring, Nikki hits a forearm smash followed by the Rack Attack for the win (4:58) *3/4. Thoughts: The action wasn’t bad but they barely mentioned Nikki’s title match against Charlotte at Hell in a Cell. Most of the time was spent pushing Sasha and asking if her new popularity would cause conflict with the rest of Team BAD. John Cena’s U.S. Title Open Challenge will happen tonight. Byron Saxton is shown asking fans about who think is the most “unconventional superstar” in the WWE. This was filmed last week in Boston. Most of them said Paige and this lead to Saxton shown on RAW interviewing Paige, who says a whole lot of nothing before pulling out a Payday candy bar from Saxton’s jacket. Nothing more than an awkward product placement segment. Cena is out for his challenge. He is met with about a 60/40 negative reaction then talks about loving this arena. He also says his WWE debut happened here and gets a few more cheers then thanks the fans for making the building a special place. Cena issues the challenge and Dolph Ziggler comes out to accept. Cole promises to tell us about Ziggler’s relationship status with Lana later on in the show. We get the dueling Cena chants to start. Cena catches Ziggler with an armdrag while the announcers put over Cena for being tired after working the Saudi Arabia tour. Ziggler then ducks outside as Cena grabs the mic. The crowd is doing the “yes” chant as Cena congratulates a guy who proposed to his wife in the crowd. She did in fact say yes. The crowd cheers for them some more as Ziggler now works the arm after an armdrag as we head to break. We return with Ziggler hitting a corner splash then a neckbreaker for a nearfall. Ziggler hits nine straight elbow drops but misses his tenth as Cena takes control briefly until he runs into a dropkick. Cena comes back and tries for the A.A. but Ziggler turns that into a sunset flip. Cena locks on the STF but Ziggler turns that into an almost rear naked choke. Cena lifts Ziggler up and hits the A.A. as Ziggler is able to roll outside. Back inside, Cena places Ziggler up top for an A.A. but Ziggler escapes then leaps up to take Cena off with a DDT in a dangerous spot for a two count. My god that looked vicious. Ziggler sets up for HBK’s Sweet Chin Music but ends up getting clotheslined. Cena tries another A.A. but Ziggler turns it into a Fameasser mid-move and gets two off of that. Both men are down then Cena locks on the STF as Dolph screams like he is dying. They are fighting up top again and that ends with Cena rolling through a crossbody and trying for another A.A but Ziggler escapes and hits a super kick the falls around to cover after stumbling around for a two count. They slug it out, throwing some sorry looking punches, then Ziggler headbutts Cena before hitting the Zig Zag but still cannot put Cena away. Ziggler gets up then runs into the A.A. for the win (17:40) ***1/4. Thoughts: Good match. My only problems are with the finish, which was terrible, and the overselling of Ziggler. Selling every move like near-death gets old and does not build to a compelling finish. Speaking of finishes, this one was as anti-climatic as it gets. Kane is back, listening to HHH and Steph on speaker. HHH is trying to find out what tonight’s main event will be but Steph is flipping out after coffee gets spilled on her so they hang up to take care of that. These segments are not the most inspired show-long bits I have ever seen. The Ascension work over Devon for a minute until as the announcers talk about the Dudleys title match against the New Day at Hell in a Cell. Devon finally makes the hot tag to Bubba, who runs wild, then the Dudley’s hit Viktor with the Doomsday Device before finishing him off with the 3-D (2:43) 1/2*. Thoughts: A quick squash to give the challengers momentum heading into their title match at the PPV. Match starts with Neville kicking Barrett in the corner. Cesaro tags and flips Neville, who hits Barrett with a 450 splash. Cesaro and Sheamus are now trading uppercuts until Cesaro wins that battle. Sheamus catches Cesaro with forearm smashes to the chest but gets decked with an uppercut that sends him to the floor. Cesaro takes out Barrett with an uppercut then tags Neville and presses him out to the floor on top of both guys. Back inside, Sheamus trips us Neville as Barrett hits the Bullhammer and gets the win (3:48) *1/2. Thoughts: Fine for what it was. I really wonder what they plan on doing with Sheamus and his briefcase because mixing it up with three guys going nowhere is not going to excite anyone when he cashes in or even becomes the champ. The ending looked bad in the sense it made no sense at all for Cesaro to chase Barrett instead of breaking up the pin. We get a creepy video package about Braun Strowman. Roman Reigns heads out to the ring. He tells the fans its good to be back in Chicago before repeating Bray’s “anyone but you” line and how it has to do with the WWE Title, dating back to the Money in the Bank title match. A lot of “What” chants that Roman addresses by asking the crowd if they can hear them. Reigns then struggles on the mic as he tells us Bray’s message is getting under his skin while the crowd chants “boring.” Reigns response to the crowd was to tell them “it’s not boring, it’s real life” as he then promises to rip Wyatt apart at Hell in a Cell and that he will be the man who could not stop him. Wyatt and his family interrupts as he tells Reigns there is a massacre awaiting him at Hell in a Cell. Reings then tells Wyatt, he will be wishing to get trapped in there with anyone but him. Well, this was a bad night on the mic for Reigns. Actually, it was a bad night in general. The material was terrible and repetititve and he really struggled to deliver it to the crowd, which was dead for the segment. If they want to get Reigns over, they need to do stuff that can actually develop a connection with the crowds instead of what they did tonight. Reigns uses all sorts of strikes on Strowman but it doesnt inflict much punishment at all. Strowman rams Reigns into the corner then lays into him as the crowd is silent. Strowman hits a scoop slam, that we get a replay of, before going back on the attack. He works a vice as the slow, slow pace is not making things fun. Reigns hits a jawbreaker and sends him into the corner with a forearm but fails in attempting a Samoan drop. Strowman boots Reigns down then to the floor. Reigns fights back from the outside and hits his apron dropkick then tries it again but gets clotheslined and falls to the floor. Strowman follows out but Reigns fights back. Harper runs over and gets hit with the Superman Punch then Strowman gets decked with one as he falls over the table. Reigns slides into the ring and just beats the ten count for the win (7:50) 1/2*. After the match, Reigns cockily walks away from the Wyatt Family then as Bray is on his knees, inviting him into the ring, Reigns decks him before heading up the ramp. Thoughts: The match was wrestled at an extremely slow pace, which makes sense, but it was still not very good at all. And the ending was something else. First off, Reigns backing down then cheap-shotting Wyatt is a heel move and where was Ambrose & Orton to even the score? Too busy fighting with themselves? Kane is listening to HHH and Steph again on the speaker but the reception is bad. HHH wants to know who Rollins is facing in the main event but loses connection before he can find out the match. Kane smiles as he sips his coffee. We get clips from RAW last week where Summer proposed to Rusev. Then Cole talks about Lana and Rusev being engaged. Rusev starts off by destroying Ryback, who comes back and sets up for the Meathook then tries the Shellshock but Rusev escapes. Rusev argues with the ref then misses a splash as Ryback finally hits the Shellshock for the win (3:04) 3/4*. After the match, Summer tells Rusev she wants the whole world to know the real man that he is to her while we get the TMZ headline of Rusev and Lana’s engagement. Summer then gets upset she found out online and not in person shows her that he is just a “whipped little boy.” Summer then does the WWE Creative adjective-ladden promo before slapping Rusev. Thoughts: Unfortunately, it seems that real-life has gotten in the way of this angle, which seems to be over. With Rusev jobbing like this, I assume it leads to a face turn but who knows. I wonder what they have planned with Summer now. She could be beneficial to anyone on the roster in need of a valet. Thoughts: They tried but had some timing issues. Owens really is a great heel. He plays the total jerk role quite well. The Lucha Dragons are just bottom of the card guys now and Kalisto hasn’t shown anything in a long time. Paige is on commentary, telling us team PCB is not over but rather going through a “phase.” Match stars with Becky hitting a pair of armdrags. Charlotte tags and works the arm. Brie tries to fight back but Charlotte hits a neckbreaker then some chops. Team Bella tries to interfere so Natalya comes over, prompting Paige to get up and argue with Natalya. Those two shove each other until Brie boots down Natalya. Charlotte boots Brie down but Nikki hits her with a forearm then Brie hits a missile dropkick for the win (3:05) 1/2*. Thoughts: The last minute of this was a complete disaster. And Brie has no business being a wrestler. Her offense doesnt look convincing enough to knock over my grandmother and everything she does feels forced and robotic. This was used to further along the Paige/Natalya feud instead of hyping the Title match at the PPV. Charlotte barely got any focus here and poor Becky is relegated to next-to-nothing roles. HHH and Stephanie finally get a hold of Kane as they tell him not to screw up the main event, telling him to remove himself from the main event. Backstage, Rollins is with the Big Show, telling him he doesnt feel like he has any support. He then tells Show that they go way back and can count on his support as Show laughs before walking away. Kane walks up and tells Rollins that he will not be facing him tonight but not to worry as he found a suitable replacement. Another hype video for Lesnar vs Taker at Hell in a Cell. We await the opponent of Rollins, who turns out to the be Demon Kane, to the surprise of no one. Cole plugs Rollins’ appearance on Sports Center tomorrow morning. Rollins tries to retreat but gets tossed back in by the lumberjacks. Kane beats on Rollins, who keeps getting tossed out of the ring, only for the lumberjacks to toss him back inside. Kane is outside but the lumberjacks back off. Rollins flies out with a tope that fails then tries to escape through the crowd until Cesaro and Darren Young drag him back. Kane goes outside after getting hit with an enziguiri and ends up hitting Show after a staredown. However, Kane walks into the KO punch then rolled inside as Rollins takes control. HE hits a knee smash from the top rope but that only gets two. Frog splash gets two. They fight up top as Kane hits a superplex as both men are down until the New Day drag Kane and stomp him as all the lumberjacks are now brawling with each other then the action heads inside with the heels stomping Kane. Big E tries a splash but Kane sits up and all the lumberjacks are inside brawling. Kane clears most of the lumberjacks then blocks a Pedigree attempt by Rollins and catches him with the tombstone for the win (8:21) 3/4*. Thoughts: Even with the stipulations and all the smoke-and-mirrors, this was a bad match. The surprise reveal of the Demon Kane as the opponent surprised no one and this storyline is not working at all. The crowd was dead. Sure, Corporate Kane can be funny but its a feud for the World Title and what they are doing is not cutting the mustard. And having Kane go over every heel in this match and beating the champ is not what Rollins needed. Final Thoughts: This was not a good show at all. The creative focus of the WWE is all over the place. When it came to Hell in a Cell, this did nothing to make me excited for the show, with barely any focus on the matches. And Seth Rollins is booked like a chump who is lucky to even have the title. He loses all of the time and does not seem credible in the slightest at the moment. The Divas Revolution has been a failure and I have no idea what they were trying to do with Roman Reigns tonight. Simply put, they do not have the ability to put on an entertaining three-hour long wrestling show.